Can Presto make the magic happen? Nothing up Foxtel's sleeve... and, Presto! Presto has updated its service, and it's starting to catch up to its rivals in terms of quality and content. Some residual bugs and price still hold it back though. Update: Presto is now available to view on Fetch TV – details below! Launching several months before rivals Stan and Netflix, and offering a library worthy far superior to anything Quickflix ever had, Presto was the first real service delivering an all-you-can-watch streaming model in Australia. While services like ABC iview and SBS On Demand have offered Australia a solid way to catch up on free to air TV, complete video-on-demand services have historically been somewhat lacking. This means that the market has very quickly exploded from next to nothing last year to a highly competitive smorgasbord of platforms to stream from. But while Presto was initially hamstrung by some technical limitations – streams were only available in standard definition, and there was no Airplay support for starters – recent updates have seen the platform improve dramatically, offering a much better service that is capable of challenging Netflix and Stan with its offering. It's still a fair way behind its competitors – as you'll see in our review below, but it is making gradual advances in usability and functionality. Working to compliment Foxtel Go and Foxtel Play, Presto initially offered users access to Foxtel's massive movie library, with streams available from all of the service's movie channels. However, the live movie channel streams were quickly killed off, and the service has since refocused on video on demand content. Perhaps more exciting was the addition of television programming to the lineup. Requiring an additional monthly fee, Foxtel leveraged its partnerships with HBO and Showtime to offer a wide selection of TV shows, from individual episodes to entire seasons, through the Presto Entertainment portal. Since launch, this rollout has continued to expand, with partnerships with NBC and BBC worldwide, among others. Now, Presto is offering exclusive streaming of acclaimed series like Mr. Robot and Aquarius, giving it a distinct point of difference to its rivals. The catch, unfortunately, is that this TV content isn't automatically included in the service's price. While Foxtel launched Presto at $20 a month for access to movies only, and then halved that rate shortly afterwards, users who want to watch both TV and movies will need to pay $15 a month for a bundled offering, or $10 a month for just TV or just movies. This price premium is a definite disadvantage against newcomer Stan, which charges just $10 a month for arguably a better lineup of content. Netflix has a local pricing structure that offers an equivalent product for $8.99, making the $15 Presto price tag slightly harder to swallow. On the upside, Presto hasn't increased the price with the inclusion of HD streams, and as the service is expanding to other devices, the price remains static. When we first reviewed Presto, it was an incredibly frustrating experience to sign up, involving browsers, activation emails and delayed payment detail input. The good news is that Presto has improved the signup process. The bad news is that you can't just download the app on your iOS or Android device and sign up from there – you still need to head to the browser to hand over your details. But once you're in the browser, the signup is relatively painless. You create an account with your name, email and password; move on to creating a PIN, sharing your date of birth and postcode before choosing your plan and then handing over the credit card details. The fact that you get the first month free as a default is nice, although it isn't too hard to come across bundle deals offering anywhere between three and 12 months of access to Presto's library. Make no mistake, Presto is an intuitive and simple-to-use service. Initially available via a web browser on a PC or Mac, or via an iPad app, Presto has added support for Android tablets and both Android and iOS phones since launch. Officially, the app supports all Android phone and tablet devices running Android 4.1 and above. The support page does add the caveat that user experience may not be the same across all Android devices, but given the range of Android devices on the market, it's not surprising that Presto can't quality check every single device. Presto has also launched on selected Samsung Smart TVs, as well as the soon-to-be-obsolete Telstra T-Box. 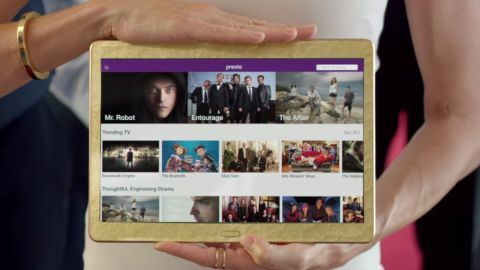 Even better news is the fact that the platform has an app on the new Telstra TV streamer, alongside apps from Netflix and Stan, making the Telstra TV the first device to host apps from all three services. But while the Telstra TV was first, it's no longer the only way to access all three Aussie services on a big screen. Presto is now available on both the PS4 and the PS3, making Sony's consoles the most versatile streaming boxes around. Presto has also arrived on the Fetch TV box, joining competitors Netflix and Stan. Presto has also expanded into Android TV powered devices, meaning owners of this year's Sony Smart TVs and the Nexus Player can enjoy Presto's content lineup. But sadly, that's the extent to which Presto apps are available. Earlier last year Presto made a reselling deal with Quickflix, which would have seen the number of compatible devices dramatically improve, but the deal was squandered by Quickflix shortly afterwards. In the meantime you're locked to a browser or tablet screen to watch the service, or a TV via Chromecast or Airplay to an Apple TV, but more on that later. One potential issue you'll face, especially with this rollout of new platforms, is that you can only have four devices connected to the account at a time. That's fine in itself, except if you want to change devices, you can only change one device per month. That means accessing the new PS4 app may not be possible until next month if you've already got a couple of phones and a couple of tablets connected. If you complain on social media channels, Presto may reset your device list for you. But it seems like an amazingly shortsighted approach in today's world of multiple devices and multiple screens. From the web browser side of things, once you've signed into your account, you can access the entire suite of on demand movies and TV shows within a few mouse clicks. The top of the page is made up of your navigation and search bar, allowing you to begin browsing by movies, TV shows or using the search function. A shortcut to your Watchlist sits next to the search function, making it easy to find the shows and movies you've saved for later viewing. There's also a quick link to the Community forums for advice and help using the service (something we had to check a few times during our review, which was a little disheartening). Just below the bar is a massive carousel filling up the bulk of your screen and pointing you to the most recent featured content. If you scroll down, you'll see a series of collections, which seems to change fairly regularly. Expect to see things like "New to Presto", "Star packed Adren-a-thon", "Animation fixation for kids on vacation" and other themes along those lines. For a combined subscription, the list of featured content seems to be split between both movies and TV fairly evenly, with between four and six titles on display, and the ability to scroll if the collection has more titles in it. Hover over any film or TV cover, and you'll see a more detailed synopsis pop up, along with a classification and general film information like runtime and release year, plus a rating from Presto users. From this window you can select to watch a movie straight away or add it to your watch list for later viewing. The iPad app and Android tablet versions have a similar user experience. Down the left hand panel is a navbar that offers shortcuts to the home page, TV, Movies, your Watchlist, your history and settings. But when you select a movie on the iPad version of the app, instead of getting a rating, Presto offers a selection of films you may also like for Movies, or a rundown of episodes for TV shows. Because of the design of the app on the iPad, there are more options on the screen which makes browsing a bit easier. Unfortunately, the actual viewing experience isn't always good. If you start streaming any older content recorded in a 4:3 aspect ratio, you'll end up looking at a box with black bars surrounding the entire picture. There's no way to zoom in to fill the screen, or even just expand it to only have black bars down the sides. It's a waste of screen real estate and a poor experience. Viewers using the Presto phone app will experience the same navigation options as the tablet version, albeit with significantly fewer selectable options on screen at any given time thanks to the limited real estate. If you want to access the Presto service on the big screen directly, you now have two options – via the new Telstra TV streaming box, or through a PS3 or PS4 playstation console. The two user interfaces are extremely different. While the Telstra TV's UI is fairly clean, the Presto app itself isn't particularly user friendly. Finding shows is a pain – there's no easy way to continue watching a program or finding the most recent episode. But the fact that Presto now streams in HD is very welcome – a look at the first episode of Mr. Robot looks great on 50 inches. The PS4 Presto app, meanwhile, is a much nicer experience. For a start, it offers the ability to continue watching shows from the main menu easily. It's not perfect – you can't really binge watch on Presto, as the software doesn't automatically start the next episode when each one finishes. On the upside though, the bug that logged you out of your account every time you exited the app has been fixed, so there's no more manually entering your password on a daily basis. But still, overall the PS4 app is by far the cleanest watching experience for the platform.